New data published today by Strategy Analytics reveals that global mobile phone shipments in the second-quarter declined 8 percent compared to a year ago. The research firm said that global shipments reached 273 million units in the quarter, down from 297 million units in 2Q08. The decline marked the third consecutive quarter of market contraction, but was an improvement on the minus 14 percent recorded in 1Q09 (the industry's worst ever quarter of growth) and minus 11 percent in 4Q08. The best performances in the study came from South Korean firms Samsung and LG, both registering their highest ever market shares, 19 percent and 11 percent, respectively. Their success was attributed to "robust demand" for their touchphones and QWERTY phones. 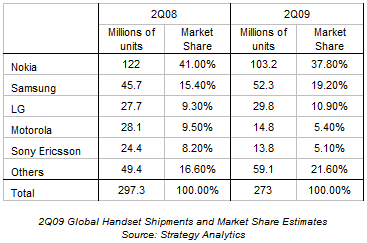 Samsung's market share has almost doubled in the last seven years (from 10 percent) in 2Q02, while LG now has a greater share than Motorola (5 percent) and Sony Ericsson (5 percent) combined. Meanwhile, market-leader Nokia shipped 103.2 million handsets in the quarter, down 15 percent from 122.0 million units a year ago, and its growth rate underperformed the industry average for the fourth quarter in a row. Its market share declined from 41 percent to 38 percent as shipments declined in all regions except China. Motorola and Sony Ericsson recorded the largest declines, down 47 percent and 43 percent, respectively. Among the smaller vendors, Apple's global marketshare edged up to 1.9 percent in Q2 2009, from 1.6 percent in the previous quarter. The firm shipped 5.2 million iPhones worldwide in the quarter.